The Moolavar is Srinivaasan, Kannan, Naaraayanan, Annan Perumaal seen in standing posture facing east. This sthalam is amongst the 11 Thirunaangur thirupadis. It is also known popularly as Then Tiruppadi (southern). The prince Suvedan, son of Dundumaaran is said to have been blessed with long life at this sthalam. Thaayaar - Alarmel Mangai. Utsavar - Padmaavati, Poovaar Thirumagal. Access to the temple One mile west of Thiruththevanar Thokai. The Moolavar of this Divyadesam is Srinivasan. Also known as Kannan, Narayanan and Anna Perumal. He is giving his seva Nindra (Standing) Thirukkolam facing his thirumugham towards eest direction. 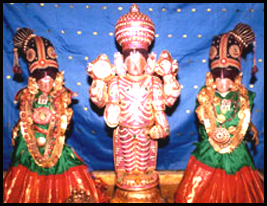 Prathyaksham for Ekadesa Rudhirar and Swetha Rajan. 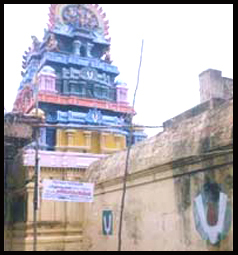 This temple lies in Thirunaangur of Tanjore district in Tamil Nadu. It's about 7 kms away from Seerkazhi and is near to Thirunaangur. Transport facilities are not provided.